Stars Over Washington: Sept 27, 2018: Dr. Christine Ford vs Brett Kavanaugh? Sept 27, 2018: Dr. Christine Ford vs Brett Kavanaugh? 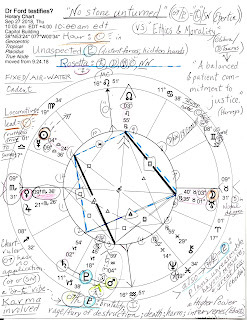 A few days ago I published the September 24, 2018 horoscope as a tentative chart for Dr. Christine Ford's testimony on Capitol Hill to the Judiciary Committee against SCOTUS nominee Brett Kavanaugh whose natal planets are penned around the September 24th chart. 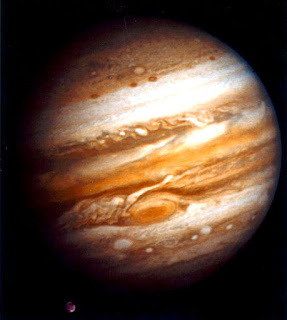 There we can see that transit Jupiter in Scorpio currently conjoins the Judge's natal Neptune in Scorpio (pretense; illusion; scandal; fanaticism; paranoia; grand ideas) while opposing his natal Jupiter in Taurus (discontent with wealth and achievement; overblown efforts; discouraging comparisons; no one is impressed--J. Skalka). So I'm feeling a bit fussy about doing another chart but for you I'll post here the September 24, 2018 horoscope set for Capitol Hill and 10:00 am edt when Professor Christine Blasey Ford is allegedly scheduled to testify. If at 10:00 am edt, Venus in Scorpio rises precisely, as you see. Sabian Symbols would be appropriate about now if you know of any. There's a rather rare Rosetta pattern between Saturn in 2nd, Moon and Uranus in 6th, Sun in 11th, and North Node ('NN') in 9th house. Does Saturn in earthy Capricorn trining the Moon-Uranus conjunction in early Taurus represent senators or possibly lawyers who support the woman/women's issues? Then Republicans are not indicated I guess. 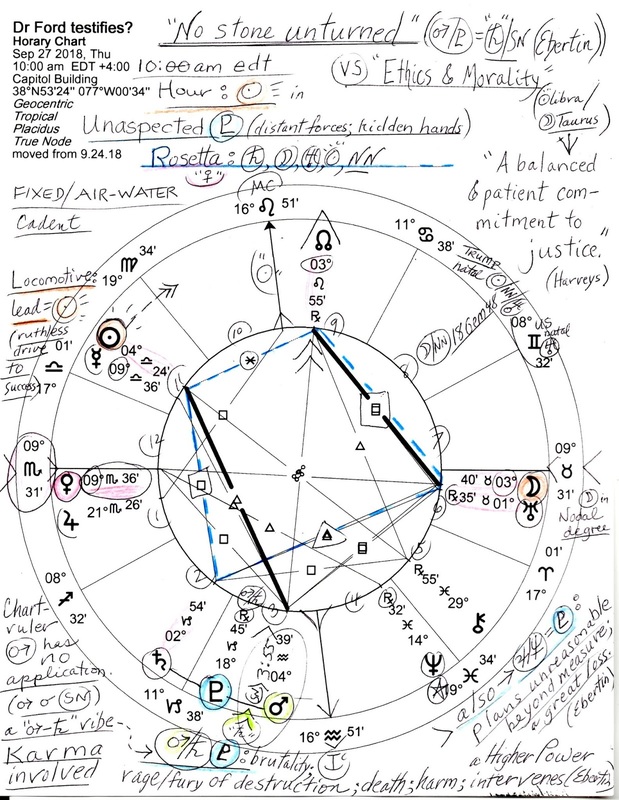 The Sun-NN sextile on one side of the Rosetta (marked in blue dotted lines) denotes the Kavanaugh side of the equation with NN in Leo, sign of leadership, lawyers, and suggesting legal societies or other types of organizations Kavanaugh has joined. In his hometown of Washington DC, he's part of the elite with the Federalist Society behind him. Ascendant and Venus '10Scorpio': "A Fellowship Supper"...positive expression: an effective channeling of personal aspirations into the common place grooves of a shared experience; negative expression: a surrender of individual distinction and exaltation of naive animality." (The Sabian Symbols in Astrology, Dr. Marc Edmund Jones). The Illumination Point of 10Scorpio is '10Taurus': "A Red Cross Nurse"...positive expression: a complete dedication of the self to the worthwhile and enduring projects through which it can lose all sense of separativeness; negative expression: a superficial pretense of humanitarianism in order to gain transient importance." Importance he wants! 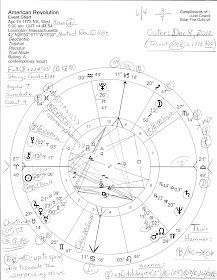 Mr. Kavanaugh's first natal planet to rise in the above chart is his Neptune @19Scorpio with transit Jupiter just passed beyond it yet retained is his natal Jupiter-Neptune opposition of "lost objectivity" (Oken) which I believe he is being accused of in these stormy confirmation proceedings. And as you know, Jupiter-Neptune can be inspiring energy but this is Politics so together I'll have to say that they make a frothy and scheming pair, often to the point of fraud. We can also identify a midpoint picture between rising Venus @9Sco36 and Jupiter @21Sco26 with his natal Neptune at apex and we get potentials for negligence; lack of correct behavior; falsehood; hopelessness; a destructive relationship (Ebertin). Any, all, or none may apply. 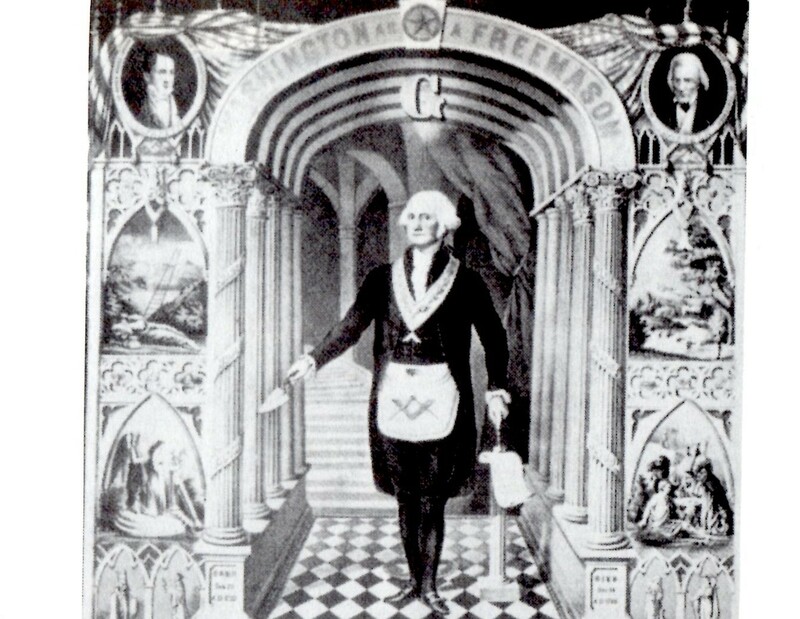 Plus, Nicholas Devore says that '19Scorpio' (which has a centuries' long reputation for being an evil degree) is "the crucial point in the war between the Ego and the Supreme Will" though I doubt Devore refers to the US Supreme Court which happens to be 229 years old this very day (September 24, 1789). Did you get it anything? Encyclopedia of Astrology, 1947, N. Devore. Well, all the planets involved have both 'enemies' and 'allies' with the configuration containing energies that 'go around in circles' (similar to the closed circuit of energies contained in a Grand Trine). But in a Rosetta, each planet (actor) tries to 'win the argument' with an opponent ('enemy') shown by opposition and its squares while the sextile and trine aspects denote cooperation from helpful 'allies'. Complexity is added to circumstances by inconjunct (aka, quincunx; 150 degrees) creating a paradox (a square peg in round hole required) and the adjustment is needed in order to reduce tension and stress. Typically, the tactic of scapegoating may be employed to divert blame or responsibility temporarily and the psychological method of triangulation may be used in an attempt to manipulate those who are uncooperative.